Football Honors: First-team all-league performer in the Cloverbelt Conference at defensive back as a junior and senior ... First-team all-Eau Claire city selection in each of the past two seasons ... Defensive Player of the Year in the Cloverbelt Conference as a senior ... All-Region and all-Northwest in each of the past two years ... Honorable mention all-state choice as a senior. 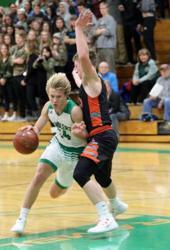 Basketball Honors: Second-team all-league pick in the Western Cloverbelt Conference as a junior ... Honorable mention all-Northwest and all-City as a junior ...Averaged 10.0 points and 7.1 rebounds as a junior. Baseball Honors: First-team all-Western Cloverbelt Conference selection as a junior ... Honorable Mention all-District pick. Favorite Sport: "Football in my favorite sport because you go through so much pain, struggles, adversity, and success with all your teammates and go through everything possible as team. It makes everyone come to together and love each other like family. The relationships you make in football are unbreakable, and the memories are unforgettable." Best Part of High School Sports: "Being able to compete everyday in any sport and being able to wear 'Regis' across my chest for every competition and being able to have such a great fan base, community, and a school that will always backs you, supports you and always wants the best for you." Best Advice from a High School Coach: "To stay calm when the pressure gets high and don’t try to win the game in one play. Just stay true to you and trust your teammates that you all will do your job." Most Memorable Moment in High School Sports: "Beating Spencer-Columbus at its field for the Cloverbelt Conference Championship, and running out of the tunnel at Camp Randall for the 2016 State Championship game." Best Part of Playing Three Sports: "Being able to play another sport right after a different season ends. This allows me to always have something to look forward too and have something else to work for. It is also so much fun to be able to play different sports with different friends, teams, and coaches. I love going up against different athletes in the different sports and being able to test my abilities to kids that are the top players in that sport and seeing how I can stack up against them." Toughest Part of Playing Three Sports: "Having to choose which sport is your favorite and having to put more time into that sport over the others. The hard part is having to lift and still practice all the other sports while in a different one, and play them while still being sore." Favorite College Teams: "I love to watch the Badgers play football and basketball. I really enjoy watching teams with high-tempo offenses and tough defenses." Toughest Individual You’ve Competed Against: "Brandon Herrick of Stanley-Boyd. We played against each other in every sport and he was just a great and tough competitor to go up against every time we played them. In football, he was the top threat to cover; basketball, we guarded each other every game; and in baseball, he was the guy to strike-out." Most Admired High School Teammate: "Cody Osborn. A lot can be said about my brother Cody. He has truly had the biggest impact on my life in every single aspect of life, and has been the main reason why I am the player and person I am today. Ever since we were just young kids running around in the backyard, he has always pushed me to new levels that I never thought I would be able to reach. Cody set the perfect example and path for me of not only what kind of athlete you should be, but what a great person you have to be too. I am beyond blessed to have Cody as a brother and as my best friend. I am just so thankful that I was able to have a couple years in high school to play and compete with him." College Plans: "Go to St. Cloud State to play football and major in business." Activities Outside of Sports: Pond Hockey, Going to the cabin, hunting and fishing, President of Student Council, member of Pep Club, Spanish club, National Honor Society, Math Team and a volunteer at Immaculate Conception Church. I Find it Relaxing to: "Hang out with the boys and be with my friends." Favorite Movie: "I’m a huge movie guy, so this question was very hard. But I love all the sports movies like Field of Dreams, Miracle and Bull Durham. I also like the comedy, action, and thrillers." Other Family Members: Julie Schober (mother), Cary Osborn (father), Darrin Schober (step father), Isaac Schober (step brother), Delaney Schober (step sister), Noah Schober (step brother), Cody Osborn (brother).